As the International Monetary Fund's annual meeting drew to a close over the weekend, Tao Zhang, the deputy managing director of the fund, outlined his view on the global economy. Zhang said the world's second largest economy is undergoing big changes as it moves towards a consumption-led economy that's less dependent on exporting cheap goods to the rest of the world. "It's already happening, it should continue, and of course during the process the rapid credit expansion needs to be paid closer attention to, and we observe the authorities are taking measures, and these measures actually already have early, positive results," he said. Asset prices globally have ignored geopolitical and policy risks, like North Korea. "We have to be alert. Yes, we have good momentum. We have to open our eyes widely and make sure . . . that these downside risks or whatever risk, will be in our minds," Zhang adds. The worry list for emerging market investors at the moment is short. "The general mood music in DC was positive thanks to robust and synchronized global growth," wrote analysts at HSBC. Yet, there is one "party pooper": Mexico. The peso is, by some distance, the worst performer in the asset class at the moment. 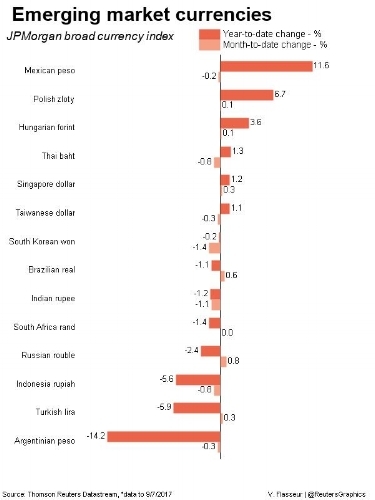 It has declined 7 per cent against the dollar over the past month, beyond the 6 per cent drop in the diplomatically-challenged Turkish lira and beyond the politically troubled South African rand, at 2 per cent. The problem, of course, is the fraught nature of talks over the Nafta trade pact, which underpins the country’s economy. It could get messy. Even then, the damage is likely to be limited, and it is worth bearing in mind that the year began with the dollar north of MXN21. “At 19, Mexico can absorb an awful lot of Nafta bad news,” says Mr McNamara. Read more from Financial Times. The Chinese yuan is rising at a rate of 6.5 per dollar as the United States deals with a hike of the debt ceiling and receding prospects of Fed rate hikes. With President Trump and Democrat congressional leaders making a deal, confidence and optimism led to the development. "With the annual U.S. debt ceiling jamboree ending in a temporary three months Trump-Democrat agreement and all waiting to see where (North Korean leader) Kim, shoots his next missile, markets are taking a breather," Simon Quijano-Evans, strategist at Legal & General Investment Management wrote. The yuan, however, persevered and rallied through the 6.5 per dollar for the first time since May 2016. The yuan has strengthened nearly 7 percent since January. American millennial entrepreneurship is down and have been on a downward trend since the 1980s. High student debt and healthcare costs diminish the chance for the skills abilities of the new generation to be fully realized. However, one area helps entrepreneurship come alive: emerging markets. In emerging markets, millennials help drive economic transformation with new businesses and services. After all, 89.8 percent of the global population under 30 lives in an emerging market. Also, millennials are more optimistic about the future. They expect to be better off financially and emotionally than their parents--71 percent and 62 percent respectively. In addition, pessimism is rampant in developed economies as 36 percent of millennials expected the situations to improve over the next year. Like optimism, there is an increased belief in businesses, more innovation, access to capital, and the inclusion of females in entrepreneurship. Altogether, the future looks bright for entrepreneurs due to the abilities of those in emerging markets. A nation's development level does not dictate entrepreneurship. You haven't missed the bandwagon for emerging-markets yet. From economic expansion to corporate earnings and capital expenditure, everything points to their overtaking developed peers through the middle of next year, according to Credit Suisse Group AG. A trajectory of profit growth should kickstrt MSCI Emerging Markets Index about 8.3 percent more than current levels, reaching 1150 by the end of June, according to strategists. "We are regularly asked by global equity and multi-asset investors if it is too late to engage in emerging market equities," Credit Suisse analysts Alexander Redman and Arun Sai write. "We argue that the answer is no; it is not too late. This view is predicated on what we believe to be compelling evidence which indicates performance attributes to be mid- rather than late-cycle." Credit Suisse strategists analyzed 10 emerging-market stock metrics and found that only two show signs of mid-to-late cycle behavior. "Investors with courage should load up on emerging markets stocks and sell off the U.S. ones," says Rob Arnott, Founder and CEO of Research Affiliates and a leader in asset-allocation investing and "smart beta" portfolios. The 63-year old goes by "The Godfather of Smart Beta" due to his role in enhanced smart-beta index funds for clients like Pimco, Invesco PowerShares, and Charles Schwab. The approach for smart-beta funds is often one of passive management, and utilizes value, low volatility, and momentum to outpace long-term returns from market-weighted strategies. Arnott built portfolios that challenge norms, and he is guided by one mantra: buy cheap assets and sell expensive ones. Right now, U.S. stocks are overpriced and emerging market stocks look cheap.